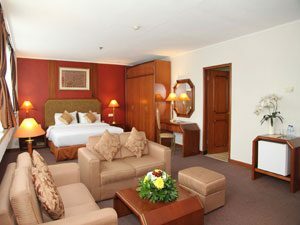 The Jayakarta SP Jakarta Hotel & Spa is a four star business hotel in Jakarta which is strategically located in the center of bustling business. 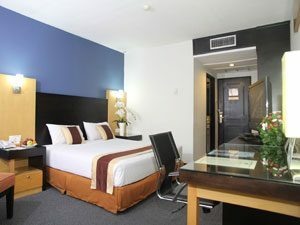 The Jayakarta SP Jakarta Hotel & Spa is located near one of Jakarta’s premier business districts in West Jakarta, Jakarta Kota. 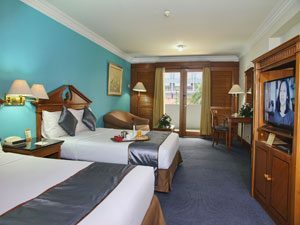 There is close access to the Inner Toll Road from this hotel, also easy access to Ancol Recreational Park. This area has many shopping and dining options. Completing the day, the night entertainments become dominating features with many various attractions. 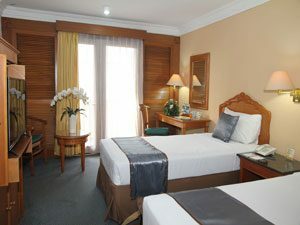 The hotel is also very near to the famous historic buildings of Old Batavia, commonly known as Kota Tua. 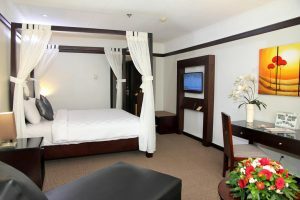 Choices of Twin or Double Bed • Balcony • Air Conditioner • WIFI Internet • IDD telephone • Mini Bar • Hair Dryer • Electronic Key Room Access • Cable TV • Coffee & Tea Making Facility • Bathroom with bathtub and shower (Hot & Cold Water) • Complimentary Room Amenities. Choices of Twin or Double Bed • Balcony • Air Conditioner • WIFI Internet • IDD telephone • Mini Bar • Writing Table & Chair • Hair Dryer • Electronic Key Room Access • Cable TV • Coffee & Tea Making Facility • Bathroom with bathtub and shower (Hot & Cold Water) • Complimentary Room Amenities. 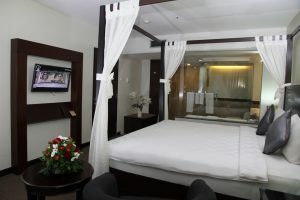 Choices of Twin or Double Bed • Air Conditioner • WIFI Internet • IDD telephone • Mini Bar • Writing Table & Chair • Hair Dryer • Electronic Key Room Access • Cable TV • Safe Deposit Box • Coffee & Tea Making Facility • Bathroom with bathtub and shower (Hot & Cold Water) • Complimentary Room Amenities. Choices of Twin or Double Bed • Small Living Room • Air Conditioner • WIFI Internet • IDD telephone • Sofa Bed • Wardrobe with Bathrobe • Mini Bar • Writing Table & Chair • Hair Dryer • Electronic Key Room Access • Cable TV • Safe Deposit Box • Coffee & Tea Making Facility • Bathroom with bathtub and shower (Hot & Cold Water) • Complimentary Room Amenities. Located strategically in business area of West Jakarta, The Jayakarta SP Jakarta is 120 minutes driving from nearest city, Tangerang, 90 minutes driving from Bogor, and about 180 minutes driving from Bandung. From Soekarno Hatta International Airport about 23 km, 45 minutes driving. From Kota Train Station about 1 km, 5 minutes driving. From Kalideres Bus Terminal about 15 km, 30 minutes driving.